When I first heard that earth eviction was the theme for the November 17th day of action, I was excited and a little saddened. I was excited because the day continues a push back against Wall Street we saw escalated by Occupy. “Wall Street is Drowning Us” would be our main theme. “Climate crisis = economic crisis.” Saddened because we have been pushed out so many times, sometimes by developers or the city, or today by planet itself. 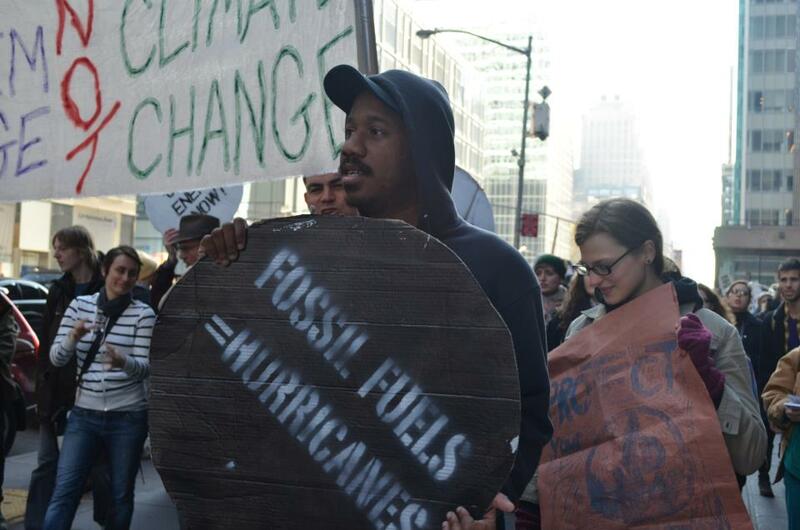 Last year on N17, we planned a direct action on Wall Street. I was part of the shrub block. Times Up! held a planning for this year’s N17 action at ABC No Rio. If earth eviction was the theme Times Up! would highlight a few of the other evictions which happen every day, especially in New York. Life here involves a constant process of navigating between spaces where we organize and build community, and the ongoing displacements, when we are forced to flee from spaces where we have slept and connected, which are just part of life in this neoliberal city. So, Times Up! organized an earth evictions ride in which we would revisit a few of these sites on the way to the N17 action beginning at the New York public library. 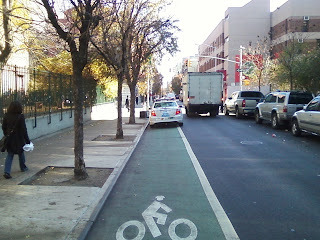 Riding over the action I stumbled upon police parked in bike lanes, as they texted and chatted. That these spaces represent opportunities for safety for riders seems to mean very little to them. The police are more than comfortable occupying community spaces, rendering them functionality useless. It is a phenomena taking place all over Brooklyn and New York. The earth eviction ride met at ABC No Rio, a squatted arts building on Rivington Street in the Lower East Side of Manhattan which has eluded eviction, though its been under constant threat. Riding up Avenue B, we passed East 7th St site of Esperanza Community Garden, a place where people shared space, a coffee, warm moments by a bon-fire during its eviction defense and subsequent bulldozing by the city in 2000. Trees outside the Lower East Side Ecology Center were still suffering after branches has been ripped from them during the storm. Up Avenue B, we rode past Kate’s joint, a veggie dive which provided food for the encampment at Esperanza back in the day, before it finally shut its doors, a victim of high rights and changing times. Further up B we rode past Charas, a community center, and Chico Mendez, a garden. Both were spaces where Lower East Siders converged, battered about ideas, and exchanged resources before their subsequent evictions by the Giuliani administration. Spaces where we meet for cross class contact are always a threat to the powers that be. Over and over again, the neo-cons of the world dismantle “the institutions that promote communication between classes, and disguising [their] fears of cross-class contact as “family values.” Unless we overcome our fears and claim our “community of contact,” it is a picture that will be replayed in cities across America.” Spaces where we connect are always facing evictions. These evictions take multiple forms. Today, it seems like the earth is evicting us. At least this is how it feels riding past the dislocated neighborhoods, ravaged by Sandy. Our ride continued past the Museum of Reclaimed Urban Spaces, whose basement was flooded by the storm. The museum’s opening was supposed to take place last weekend, but it is being pushed up to December 8th. And of course, a year ago this week, we were evicted from Zuccotti Park, by the NYPD. Time’s Up Delivers Foods, Blankets, Bike-Powered Charging Stations, and Mobile Bike Repair to Neighborhood Devastated by Sandy. The weekends of Nov 10th & Nov 18th Times Up! 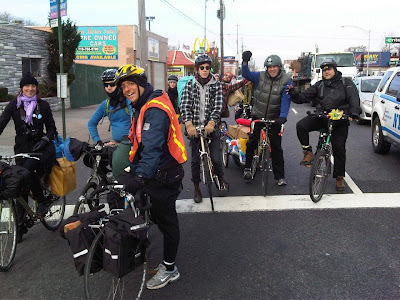 organized Fossil Fuel Disaster Relief bike rides to deliver food, blankets and other much-needed supplies, over 10 bike-powered charging stations, and mobile bike repair units to neighborhoods in the Rockaways devastated by Hurricane Sandy. Using human power & their fleet of bike-trailers, cargo-bikes & baskets they picked up heavy loads of supplies from Occupy Sandy’s main distribution center at 520 Clinton Street in Brooklyn and cycled them over to the Drop-off center in the Rockaways run by Rockaway Taco & Veggie Island at 183 96th Street. From there the volunteers distributed individual packages to home-ridden families in hard to reach areas, helped with clean-up, demolition and construction, and provided free bike repair and bicycle-generated power – sustainable solutions to the devastation caused by climate changed from the burning of fossil fuels. The Time’s Up! energy bikes, used to generate bike power for OWS last year, will stay in the Rockaways to be used by the community as an alternative to the gas generators currently being used to charge devices operating only at 1% capacity and pollute the air we breath. These rides highlight the need for relief not only from the immediate disaster, but also the root-cause of this disaster and others – the burning of fossil fuels. Throughout the week, Keegan (a fellow Times Up! member) and I had talked about the similarities between Shakespeare’s Tempest and the efforts of Occupy Sandy. New York really was hit by a tempest. Yet, in response, we have started creating a new world based on care, mutual aid, and innovation. At Judson on Sunday, Michael Ellick suggested that such a world requires a framework for radical forgiveness of not only debts but of sins and personal flaws. It imagines creating a new form of ethics, something new of our social relations. It also requires care. Arriving at the Times Up! space Peter Shapiro and Keegan greeted me. I said hello, introducing myself to a few of the other riders. One man worrying about his knees before the ride, when Peter chimed in that he needed not worry about he knees or feel like he needs to rush. Afterall, “even a crotchety guy” like him “could find this ride to be transformative” after he took part the previous week. The Rockaways are full of lovely oxygen, great air we can all enjoy. Air that will revitalize us, he explained. Throughout the trip from 99 S. to 520 Clinton Ave, we all talked, enjoyed the air, and the convivial social relations. 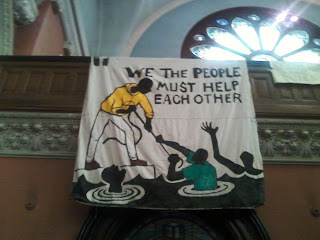 When we got there, we all enjoyed the mutual aid signs seem all over the church. Mutual aid is a different set expectations; it asks us all to share, to be fully human. It helps highlight who we are and can be. And most of all it is direct action. Gandhi implored his followers to spin their own fabric in defiance of British colonial rule. In doing so, he suggested they could create their own power. Energy emanated from spinning their own clothes. “The spinning wheel represents to me the hope of the masses,” stated Gandhi. The same thing happens people powered energy, Times Up cycling events and energy bikes, recharging people’s phones, while sharing our lives with others. Through these rides, we divest ourselves from dependence on fossil fuels, while sharing what we have with others. The joyous rides, in which we pull trailers of supplies from 520 Clinton to Veggie Island, are our form of mutual aid. With these expanding mutual aid networks in mind, Alexandre Carvalho , of the Occupy Revolutionary Games Working Group, sent a post on “The #MutualAid network and the aftermath of #OccupySandy” to the September 17th list serve on November 19th. I really see the advent of #OccupySandy as the beautiful religare to Occupy’s spirit of Zuccotti Park. a relational atmosphere that was missing from the scene in a while and is the cornerstone of what we do – a deep respect and solidarity with human beings in suffering, first and foremost. Meaningful movements have Lost Paradises, certain lost times, which serve as ethical compass for political dispositions. the park is our Paradise Lost. that eerie smooth human atmosphere that is at the core of what makes us human. The parks and streets and communities of the world are our roving Paradises – this time, Paradises that can be found and built together. Aristotle once wrote that #poiesis is to “learn by making”. 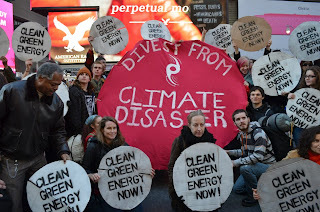 the new #Mutual Aid network of OWS should stay even after the destruction of the hurricane is over and done: there will always be natural disasters, and human-caused disasters to struggle side-by-side against, such as poverty, oppression, violence, environmental degradation, labor exploitation, injustice. These silent daily disasters also need a hurricane of mutual aid. a grassroots #MutualAid arm, delivering direct [mutual aid] action from the people, by the people, to the people. seems to be the rebirth of OWS, from a political and ethical standpoint: always inviting and invited, respectful of differences, listening first and talking last, non-controlling or mass maneuvering, and above all making love the highest play. Much of this spirit powered our ride down Bergen across Brooklyn on Flatbush to the Rockaways. “It was a wonderful ride,” noted my friend JC as we crossed the bridge to Jacob Riis, where piles of rubbage fill what was once a putt putt golf course. “That’s so telling of our culture,” mused JC. A peddi cab driver, he had taken part in our puppy pedal parade earlier in the spring. The rambunctious ride was enjoyed by kids, animal lovers and cyclists. “Love seemed to emanate from that ride,” he mused. With piles of wreckage to the right and water to the left, we rode along the waterline down to Veggie Island at 96th Street. “The sea looks like it wants to run over the wall and up the street,” Keegan noted looking at the water lunging up to the sea wall. Rising sea levels are transforming the way we understand cities. And none of this phenomena is new. Cities such as Venice, Italy have been coping with rising sea levels for years now. New York’s waterfront has always been permeable. Battery Part was once a landfill from the World Trade Center. One day, the wreckage may be covered by sea once again. “The earth does not have opinions. It just does what it does,” noted Peter, overlooking the piles or rubble. “It looks like a third world country,” noted my friend Stephen, who lead the ride, as we arrived in Veggie Island. Piles of trash lined the streets, houses condemned, couches in the middle of the streets – scenes of Sandy along the waterfront. It was all so reminiscent of Katrina. I dropped material off, turned around and rode back up Flatbush home, past Brooklyn’s neighborhoods, along the Botanical Garden, where yellow leaves line the sidewalk, once mighty trees coping without broken-off branches, open skies where there were once trees. Down Union Street my ride took me through Park Slope, across the Gowanus Canal, home and back to school to teach. It’s a good tired finishing a ride like this, a good tired of nearly forty miles connecting my life with larger movements of people, hopes, aspirations, tragedies, pleasures and anguish of a world far bigger than myself. NEW YORK – My son and I arrived in lower Manhattan to march over the Brooklyn Bridge. We jumped into the line and marched slowly in a most peaceful crowd. This experience was life changing in a number of ways. In all my years of visiting New York, I have never been with such patient, kind and friendly people. There was absolutely no pushing or lude behavior of any kind which is wrongly expressed by Fox news. No one was drunk, unkind or out of control in any way. As we approached the top of the bridge, we had the good fortune of meeting Chris Hayes from MSNBC. He was very friendly and polite. We then met up with the mobile book library and donated several books in spite of the police taking over half of the library’s books while purging Zuchotti Park then not returning them. We arrived in Brooklyn to a great deal of celebration and just in time for the General Assembly meeting. Overall, by far the most enjoyable time in New York City in a very long time. We cannot wait to return! Like many people I was disgusted by the Zuccotti Park raid that took place Tuesday morning. So when I heard about the Brooklyn Bridge march on Thursday night I felt compelled to act. I was impressed by how many people came out to show their support at this critical point in the movement. But what really caught my attention was the overwhelmingly positive reaction we received from the drivers on the Brooklyn Bridge. In a spontaneous gesture of solidarity hundreds of drivers slowed down, honked their horns, waved their fist in the air and cheered us on. I imagine the last thing many of them heard about Occupy Wall Street was the nationwide crackdown that culminated in the Zuccotti Park raid. Many may have assumed that would be the end of the movement. For those, I believe it was especially important and uplifting to see thousands of people from all walks of like marching in defiance of brutality and in support of social change for a better society. And this all took place in view of an amazing guerrila light show on the Verizon building. It was quite a galvanizing moment. NEW YORK – This morning I woke up before dawn and rode the subway downtown. By 7:00 am there were hundreds gathered two blocks north of Wall Street, across from Liberty Plaza and every minute the crowd grew. There was a massive police presence and lines of helmeted officers blocked us from advancing south, so groups of a few hundred each started marching east. The police had frozen a large area around the stock exchange and set up checkpoints at each entrance, closing off public roads and sidewalks. If you had a political opinion, you could not enter. We gathered at each chokepoint and we took the streets. People locked arms in long lines across the street and stopped the workers heading to Wall Street. Over the next few hours, as I wandered through the streets, every intersection toward Wall Street that I saw was jammed with people. The police would periodically push through and open a corridor, letting workers with badges pass, and we would periodically close it again. Some of the people passing through nodded their heads and smiled at us, others yelled and cursed, and a few brave ones stopped to talk. At one point, to clear the intersection, police held up metal barricades and charged into the crowd, knocking people to the ground, rushing past them, then arresting them. At 11 am many people left the intersections downtown and gathered in Liberty Plaza, which was surrounded by police and metal barricades zip-tied together. They were only letting people in and out through one of two entrance’s and checking them as they went. Much of the crowd gathered outside, reluctant to enter the pen. Then a small group pulled the barricades apart at one section and a crowd flowed toward them to help. Within minutes an entire wall was down and the barricades were piled in the center of the park. It was amazing. Back into the streets for me, there’s still a whole lot of action before this day ends.